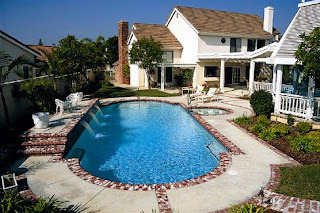 In part one I spoke about the requirement for residential pool turnover is 8 hrs and before I dive any further into this subject, I will say that if at any time there will be use of the pool, you should have your pump running for at least that 8 hrs. Now that I have added my disclaimer… In part 1 the statement of “run your swimming pool pump as long as it needs to run” was made. The requirements are there by law but in many instances because of different features on your pool, your pump system may circulate your pool at a greater rate than what is required. There are ways to calculate how much water flow your pump is producing to help see how long to run the pump. For that you can on on-line to your pumps manufacturer and get the specs. http://www.haywardnet.com/inground/products/displayProd.cfm?ProductID=11. This link is an example of what I am describing. Ok, you thought this was going to be simple, let me help with that. First of all, fact the longer you run you pool the longer it will stay clean. So if you just want your pool to stay clean and do not care about the cost, run your pump 8 hrs, 16 hr, 24 hrs a day. On the other side, if you want to save the money. Start with 8hrs. if you pool stays clear, chemically balanced and algae free for a week, drop it to 7hrs. Repeat this process until you get your run time as low as possible. If the water at any point starts looking a little dingy or you can not keep your chlorine present, increase the runtime an hour. Two details to remember. You should only try this if you are going to be around daily to see the progress. Secondly, these steps would need to be done several times throughout the year as temps raise and lower. What are the possibilities. I have seen pools run 2 hrs a day during the winter and stay clear and under control the entire time. That’s a 75% savings on their electric bill. Thank you for the nice comment. We are here to help. We also have on-line sales for all the pool supply needs. Find us at http://www.swimclearpoolsupply.com.